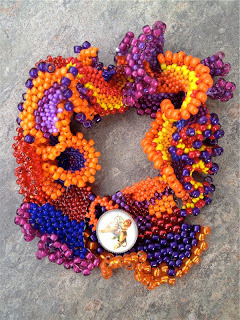 I always love to see what others come up with, working with freeform peyote. The more freeform peyote the better. I especially love it when they allow me to take pictures and share them. Today I have two pieces from two very different artists to share with you. 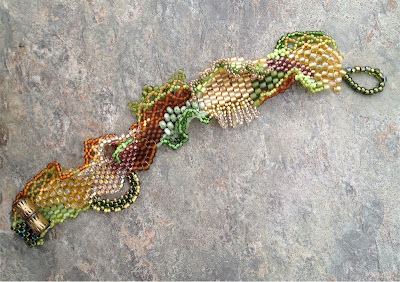 The first is a wonderful freeform ruffles bracelet by Jennifer Engstfeld. 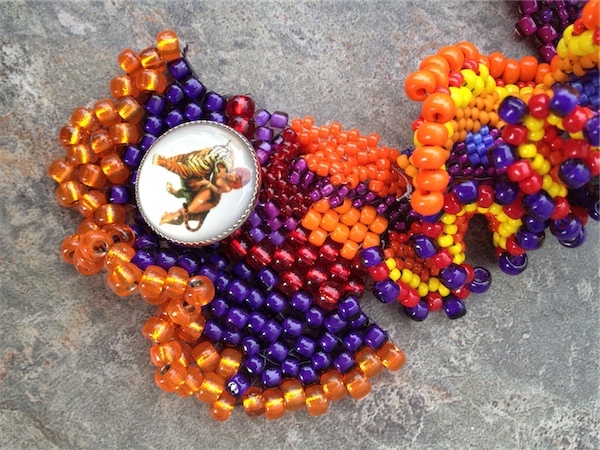 Her color scheme was inspired by my Spanish Dancer bracelet, but the ruffling is all her own. Jennifer makes far greater use of size 8 seed beads than I typically do, and uses a lighter tension, both of which gives her bracelet a supple, cloth-like feeling that mine definitely does not have. And I have to call out a special thanks to Jennifer for helping to round up students for my class as well - Thank you! Here are a couple more shots of her bracelet, to help you get a better feel. Jennifer Engstfeld's bracelet laid out flat - love the dimensionality! I love the whimsy of Jennifer's button, too! The colors in the next bracelet by Jennifer Porter were inspired by the subtle colors of early spring in either the Squamish Slough. 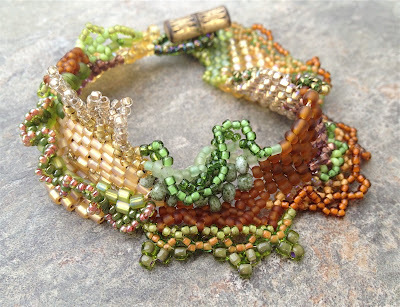 I love her subtle use of color - and some of the surprises, like the transparent peridot seed beads with the blush pink center. Gorgeous. The first picture is so you can see the full length, then I tried to get closer to share the details. 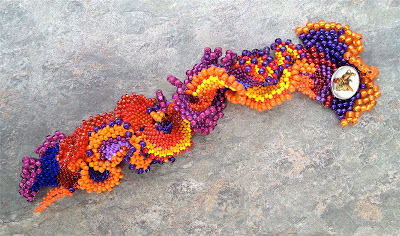 Jennifer does a lot of what she calls "organized freeform"; starting with a band of standard peyote and then embellishing heavily over the top. This is her first 'freeform from the get-go' piece. So, do you have any freeform beading that you'd like to share? Let me know and send me a picture or a link and the story behind the piece. Both are so beautiful! Love the fullness and boldness (and button!) of the first one...it really does look like a Spanish Dancer's skirt in motion. And I really am soothed and connected to the colors and flow and details of the second one. Definite incentive to loose my fear and inhibitions and put your book to good use. Great Job, Both Jennifers! Oh you do inspire don't you! Gorgeous pieces! Love those colors on the orange and blue bracelets.